A partial shutdown of the Colonial Pipeline system, a major source of transportation fuels to the Southeast, has disrupted gasoline supplies, leading to higher prices and product shortages in parts of the region. On September 9, Colonial Pipeline shut down its Line 1 pipeline in response to a leak in Shelby County, Alabama, about 35 miles south of Birmingham. Repair and restoration activities are currently underway, including the construction of a 500-foot, above-ground bypass around the affected section of pipeline. The bypass is expected to allow the pipeline to resume operations on Line 1 as early as today. 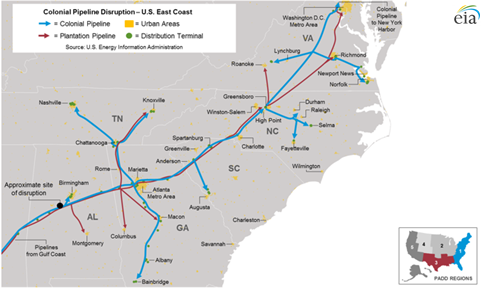 Colonial Pipeline is a significant source of transportation fuels supply for the Southeast and East Coast, particularly in the states of Georgia, South Carolina, North Carolina, Virginia, and parts of eastern Tennessee. The U.S. Southeast (as defined by Petroleum Administration for Defense District, or PADD 1 subregion) includes Georgia, South Carolina, North Carolina, Virginia, and West Virginia. These five states represent approximately 12% of total U.S. motor gasoline consumption and 34% of PADD 1 consumption. Because there are no refineries between Alabama and Pennsylvania that produce substantial quantities of transportation fuels, the U.S. Southeast is supplied primarily by pipeline flows from refineries along the U.S. Gulf Coast and supplemented by marine shipments from the U.S. Gulf Coast and imports. Colonial Pipeline is a 2.5 million barrel per day (b/d) system of approximately 5,500 miles of pipeline and consistently runs at or near full capacity. Colonial connects 29 refineries and 267 distribution terminals, carrying refined petroleum products such as gasoline, diesel, heating oil, and jet fuel from as far west as Houston, Texas, to as far north as New York Harbor. 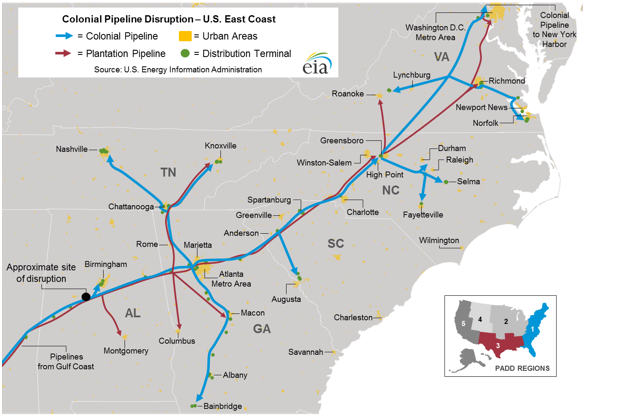 Various branches of Colonial Pipeline supply markets in central and eastern Tennessee, southern Georgia, and eastern and western portions of Virginia. Colonial Pipeline's Line 1 carries approximately 1.4 million b/d of gasoline from the Gulf Coast to a major junction and product storage hub in Greensboro, North Carolina. From Greensboro, two pipelines (Lines 3 and 4) carry a mix of fuels farther north to Maryland and Linden, New Jersey, near New York Harbor. As Colonial Pipeline works to restore service on Line 1, gasoline shipments were temporarily allowed on its Line 2, which normally carries about 1.1 million b/d of diesel, heating oil, and jet fuel, to Greensboro, North Carolina. However, these gasoline supplies were less than the volumes that would have normally been transported on Line 1, and they displaced distillate supplies that would have normally been shipped on Line 2. Gasoline and other petroleum products also continue to be delivered by Plantation Pipeline, the other major pipeline transporting supplies from the Gulf Coast to as far north as the Washington, DC area. With a capacity of 700,000 b/d, Plantation has about half the capacity of Colonial Line 1 and ships a mix of gasoline, diesel, and other fuels. Like the Colonial system, Plantation also runs at or near full capacity. Inland markets in the Southeast that depend on shipments from Colonial do not have easy access to alternative supply sources other than long-distance trucking from distant supply points. Markets along the East Coast with access to deep-water ports, such as Savanah, Georgia; Charleston, South Carolina; Wilmington, North Carolina; and Norfolk, Virginia, can receive limited imports from the global market and marine shipments from coastwise-compliant ships originating from the Gulf Coast. Federal and state governments have issued regulatory waivers and notices in an effort to make additional supplies more readily available. The U.S. Environmental Protection Agency issued waivers that allow conventional gasoline to be sold in metropolitan areas that normally require reformulated gasoline, as well as waivers for Reid vapor pressure specifications. As of September 16, six states have issued waivers on hours-of-service restrictions for truck drivers delivering gasoline. Because pipeline shipments of gasoline move at approximately five miles per hour, some markets may still experience supply shortfalls several days after service is restored on Colonial Pipeline. GasBuddy, a retail gasoline price comparison site, recently launched a tracking tool to determine fuel availability at thousands of retail stations in the Southeast. Limited availability of gasoline at some local distribution terminals and the higher costs of alternative supply options will ultimately influence the retail price of gasoline. On September 19, the average retail price of regular gasoline increased eight cents to $2.17 per gallon from the week prior in PADD 1C, a region that includes several states along the southern Atlantic coast. EIA's This Week in Petroleum, published later today, will also cover this topic.